Raising investment capital for a start-up cannabis operation is challenging. Do not believe the hype of MJBiz and other internet websites. They are full of it. People with capital are looking for safety and to not be criminally charged by the Federal Government. Many investment funds have been burned by cannabis deals that have gone south. This is a basic reality. You need to think long and hard about what you want to accomplish and you need a well thought out Business Plan with financial models. The mickey-mouse cannabis business plans on the internet are not going to cut it. Secondly, you need a management team with experience and persons that are honest. No one is going to invest in a convicted felon. 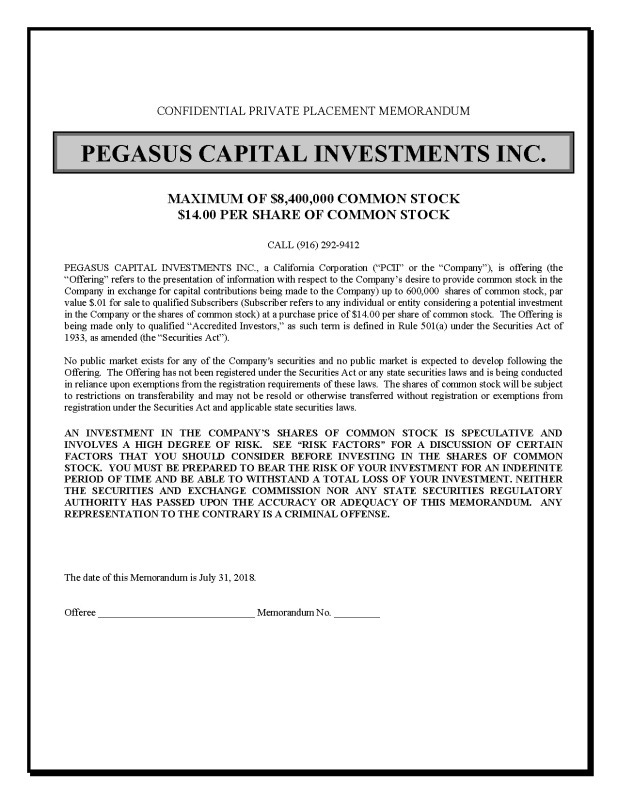 Below is an example Private Placement Memorandum for Pegasus Capital Investment Inc. Look at it and study what it contains. No one is going to hand you millions of capital based on a 15-page PITCH DECK. You plan has got to be smart, comprehensive and better have management personnel older than 30. You need a CFO, an Attorney and experienced Operations personnel as part of your team. You also need a Marketing Plan that is attainable and a realistic budget. The California Cannabis Industry is going to be very competitive and there is going to be an over-supply of cannabis. Your presentation has to address these future issues or else you are dead in the water. No one is going to fund a transaction based on BRANDING. Strong and Experience Management Team. Do not waste time on BRANDING. No one cares. Legal Counsel Experienced in Cannabis. You Need More Than Sweat Equity. You Have to Contribute Capital. Pitch Deck That Does More than Pitch BS. Understanding of Security Laws and Who You can Pitch. Professional Accountant to Maintain your Books and Records. Cannabis POS integrated to a Back-End Accounting System. How Your Requested Capital Was Arrived At. Ramp Up Period to Market Your Products. Realistic and Detailed Capital Expenditure Budget. Full and Complete Understanding of IRC 280E, IRC 263A, IRC 471. Ability to Explain Where Your Production Facility is and Why. Complete Understanding of Local Taxes and Fees You Will Be Subject To. Realistic Timeframe to be Licensed. Marketing Plan and the Marketing Team. Be Prepared to Work 14 Hours a Day and 365 Days Per Year. Be Completely Honest and Forthright. Do Not Try to be a SmartAss. You Know Less Than You Think You Do. Do Not Claim You Are a Master Grower With Unique Genetic Strains. Everyone Has Heard That a 1,000 times. If You Claim You Have a Special Strain Then Bring the Test Results.